HMC Insight Issue 10 - How well does “British-style”education travel? How well does “British-style”education travel? How well does “British-style” education travel? As Heraclitus the pre-Socratic philosopher so accurately observed many years ago, “Everything changes”. When I first went abroad to teach back in 1991 to Hong Kong, at that stage still a British Dependent Territory, I was told by many educational sages that I was committing professional suicide. “What do you want to go there for? It’s foreign.” “You’ll never get back, you know,” warned others. In reality, the school I went to was far ahead of most schools in Britain in terms of its teaching, its care for its students and its willingness to acknowledge that the world was changing rapidly. Similarly, after a brief return to the UK, my move to Brunei in 2000, on the island of Borneo (most people actually thought it was an Arab emirate), bred further disdain. Once again, I found a school far in advance of its counterparts at home, not least in its capacity to assimilate students and staff from a variety of nationalities to form a model of how to make the best of multiculturalism. Now, of course, international education is all the rage. British-style schools are opening apace in many different countries. HMC and COBIS (the Council of British International Schools) chart their trajectory regularly. 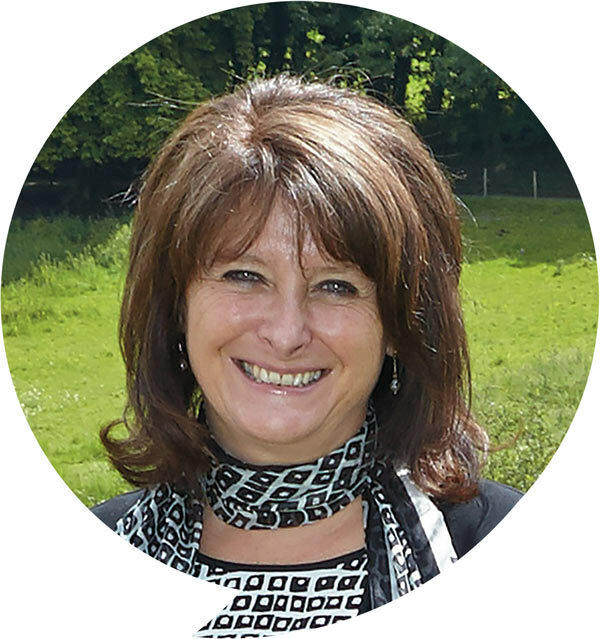 Moreover, there are schools emanating from other nationalities, including a new venture which is to offer “a global school” – one school on many different campuses across the world. Certainly, there is a demand for franchised-type schools which even mimic the buildings of their alma mater, but to equate this with a desire to imitate all things British would be an error, particularly as the somewhat battered lion wrestles with Brexit. What most of those who send their children to British-style schools want is for them to be taught in such a way that they will be able to gain admission to leading universities across the world. This involves the development of academic rigour and intellectual curiosity and the ability to hold one’s own in the generally discursive culture of the “Western” world. Many parents – and students – want the combination of academic progression and extra-curricular opportunity that British-style schools can offer, but there are limits, not all of which some British-style schools will find comfortable. Most foreign national parents, especially in Islamic countries and in that largest of markets for international education, China, want their children to maintain respect for their own cultures and religion. They do not want their children to embrace the increasingly libertarian liberal attitudes of the West. This means that much that goes on in the school requires acute sensitivity to national perspectives. 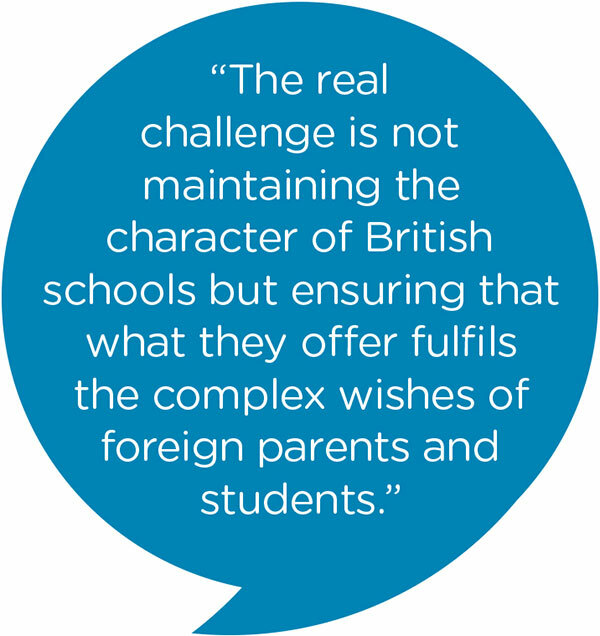 So, the real challenge is not maintaining the character of British schools but ensuring that what they offer fulfils the complex wishes of foreign parents and students. Not only is the past a foreign country where they do things differently, but international schools, British-style or otherwise, operate in foreign parts where “they” still think differently, too. 1. Rhiannon’s eldest son taking part on Sports Day at Jerudong International School, Brunei. 2. Rhiannon’s younger son being taught how to use chopsticks in China. 3. 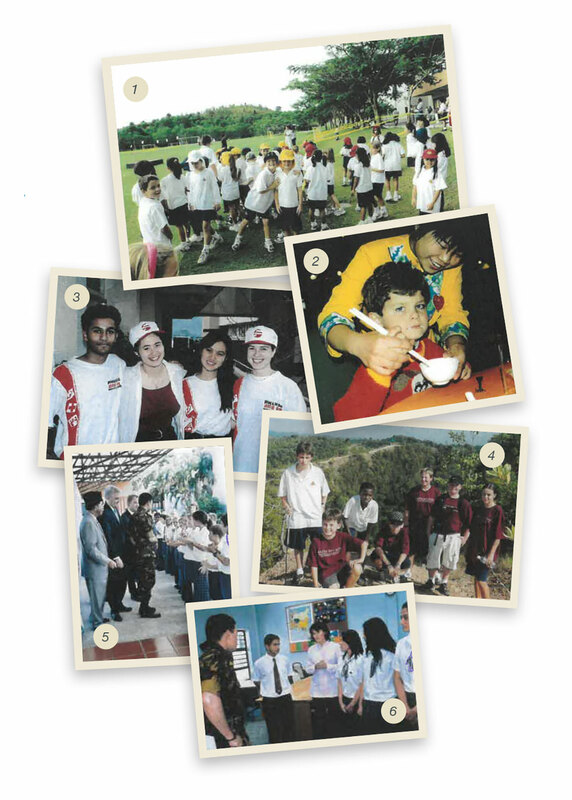 Sixth form pupils from Sha Tin College, Hong Kong fundraising for Rwanda in 1994. 4-6 Pupils from Jerudong International School, Brunei: marking Earth Day with a whole school walk in the rainforest and welcoming the Crown Prince of Brunei, Al-Muhtadee Billah.